I was examining requisition requests with Suzanne our Chinese Purchasing Officer at the Singapore office when she dropped that one on me. I smiled, and her face clouded over with uncertainty. Well I eventually did go golfing with Suzanne’s husband and it was a bit of a fiasco. Not being confident enough to go to a club I decided to reorient through a driving range. Now everything in Singapore is world class and it was apparent from those streaming in and out of the driving range the upper crust frequented this place. A troop of Japanese tourists was disembarking from two buses when we arrived and my friend urged me to hurry inside so we would be assured a place. At the desk they demanded my friend’s credit card and promptly filed it in a specially constructed drawer handing him a token and a string bag of golf balls for both of us. “You leave our credit card with them? I would never do that!” I said. “You want to play, you follow the rules.” He said. As I faced the range and placed my ball on the tee my legs trembled. I hadn’t touched a golf club for fifteen years, and having been in Singapore most of that time I was aware of what it means to lose face. To make it worse the Japanese tourists decided to pack behind me to see how I performed. Well you do remember some things; shoulders forward, head down, and don’t lift yourself up when you connect. Make sure you know where you’re aiming at and don’t top the ball or get under it when you connect. To my great surprise the neat little click told me I’d hit a perfect ball. The Japanese cheered and had a loud conversation of appreciation between them. My spirit soared! Then that little devil called pride rose up within me. I confidently placed my next ball and turned to acknowledge the accolades of my new Japanese friends. The next ball was missed, the follow up was topped and a whole series of calamities occurred. The Japanese marched off to accumulate behind a more worthy soul with exclamations of disgust. My experience of fifteen years previous was a much more enjoyable and humorous occasion. 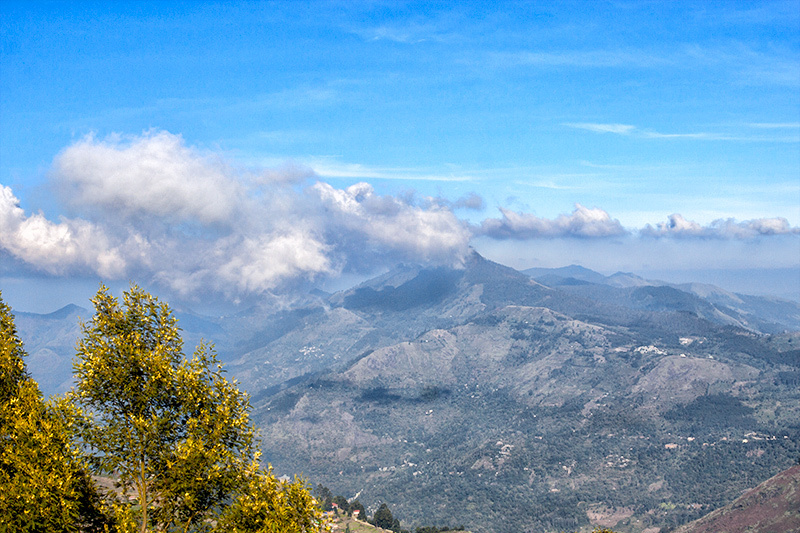 We were on top of the mountains at Kodaikanal, Tamil Nadu, India on our usual annual vacation. Occasionally I would be invited out with my professional golfer friends Roscoe and Ellsworth who had membership in the club, and had been vacationing there for many years. George and Lyn who were further up the evolutionary chain of golfers than I was were also with us that happy day. It was an act of charity for Roscoe and Ellsworth to invite us lesser golfers. Lyn went first and amazed us with the world’s first boomerang shot. Not surprising seeing Lyn was Australian and we are all supposed to be proficient with the boomerang. You could see that ball curve until it hit numerous trees at the perimeter of the course and make a valiant attempt to return to its owner. Roscoe and Ellsworth followed with one of those neat click shots I’ve already described and the balls sailed over the chasm and onto the next hill within reasonable proximity of the number one hole. Now at this point it may be well to describe the Kodai golf course. Not far from the building where we signed in and enjoyed an occasional limbu pani after completing the mountainous hazard course was a drop off of magnificent proportions. You could look over the side of the mountain to sweltering plains hosting myriads of villages which winked through the fog at you each night. The course consisted of several hills which required you tee off, descend to the depths where mountain streams flowed, and climb up to find your ball on the other side. On the lower slopes toward the streams there were thick growths of cabbage like vegetation. These were a major hazard to those who were not powerful enough in their first smack of the ball. Add to that the regular tribe of animals which traversed the course from one strip of jungle to the next. As you walked the course you would be reminded of the good old days as you passed signs like Tiger Path. It was now George’s turn to follow the leaders. He paused momentarily to view the far distant pole half way up the next hill and glanced at the cabbage patches on the lower slopes. Something to be avoided! Between the cabbage patches and the hole a group of cows materialized from the jungle and began to graze. One had its tail up discharging spent fuel in our direction as George made a perfect connection with the ball. It sailed majestically toward the cows and disappeared from sight. The cow performing its regular routine dropped its tail and galloped off into the jungle. We all collapsed with laughter and after we’d recovered our composure I sent my ball on its way and we began our long commute down the hill, over the stream and up to where we had mentally noted our balls should have landed. Lyn whose second shot had landed over toward the jungle side of the hole ambled over to take his shot while we each found our respective positions. After some time we noted George still wandering around looking hopefully for his ball. We joined him and searched every nook and cranny of the area looking for that ball. It was nowhere to be found! Then we remembered the cow and its sudden exit from the course after that fatal ball had been sent on its way. Could it be that George had scored a hole in one? Na! But the possibility sent us into fits of laughter which stayed with us the remainder of the course. We let George choose another ball and advance from the approximate area from whence the cow had fled. I suppose we should have done the right thing and marked him down for a one shot. Thanks for the chuckles indeed! 😀 Wondering why the club would need to hold credit cards from members. I can understand the need to do it with tourists or even affiliated members. Everything is organized in Singapore. Rules are rules and there are no exceptions. 🙂 My wife was terror stricken when we moved there and she had to drive with rules. I thought she was going to move back to India without me! lol. India is the ultimate democracy where everyone does right in their own eyes. I just heard on news radio that countless golf courses have sprouted all over China even though they’re illegal. Huh. Just hit me – that was what happened with the underground churches. Forbid something and there you go — people want it. Yes the underground churches are real, substantial and growing in China in spite of the frowns and sometimes active action against them. Hi Ian, thanks for the chuckles! Well written and told! When I was 13, my parents taught me how to play and I won 1st place in a tournament. I played for a few years but as an adult, I was more interested in tennis. My husband and I are the only non-golfers in our families, however, on our vacation last week we played the putting course several times and had a blast. It is a real grass course, beautiful, with water and sand challenges. We almost did the driving range but felt a bit inhibited. 🙂 We have golf courses near our home though and we just might give the driving range a visit. Something different to do..thanks for sharing, I enjoyed this very much. It’s a good game. Go for it! Coming from a family of golfers I must say you had me giggling through this entire story, which you told quite well. Poor George! Great story – well told. I already had an inkling of what was coming from your post, some time ago, on my story “Ace” . You made the story very rich with the golfing and cultural references. I gave you a preview? You’re special! lol. My father in law visited us in Singapore and went golfing with the husband. He met with a bit of culture shock! The booking procedure was one thing (you can’t just rock up on Saturday morning and see who’s playing), then the compulsory caddies…! It is quite a bit different from the Land of Oz isn’t it? Well not being the golfer I don’t have much personal insight, but so I’m told! Now, we’ve all heard of holes-in-one but your friend George’s is remarkable – and what an understatement. I agree with Yoshiko and would never ever turn in my credit card – now. But there was a time when we trustingly did that, I suppose. I’ve done that a couple a times when entertaining clients at watering holes. Yes we did a few rolls around the ground laughing at George’s hole in one. lol. The poor man died here in Australia a couple of years ago, and Lyn before him. We Australians must be weaker as the Canadian and American mentioned are still going strong. I watch my credit card very carefully as they process it at a distance from me at a restaurant. I take it to the counter rather than give it to the waiter.